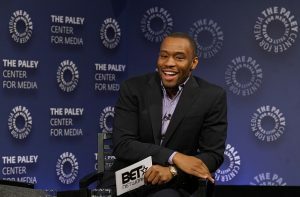 Liberal CNN commentator Marc Lamont Hill defended violent Palestinian attacks against Israel on Wednesday, employing a phrase common among those who reject Israel's right to exist: "Justice requires a free Palestine from the river to the sea." Hill was speaking at the United Nations during its annual International Day of Solidarity with the Palestinian People. The international body has shown overwhelming favoritism toward the Palestinians—and animosity toward Israel—throughout the longstanding conflict. According to a report in Arutz Sheva, Hill blasted Israel's treatment of Palestinians and used the oft-repeated attack that it had turned the Hamas-controlled Gaza Strip into "the world's largest open-air prison." He then said while peace should be prioritized and nonviolence should be promoted, we "cannot endorse narrow politics that shames Palestinians for resisting." Resistance is a common euphemism for terrorism employed by anti-Israel advocates. "Tactics otherwise divergent from Dr. King or Gandhi were equally important to preserving safety and attaining freedom," he said in remarks flagged by the Washington Examiner. "If we are in true solidarity, we must allow them the same range of opportunity and political possibility. We must recognize the right of an occupied people to defend themselves. We must prioritize peace, but we must not romanticize or fetishize it. We must promote nonviolence at every opportunity, but we cannot endorse a narrow politics of respectability that shames Palestinians for resisting, for refusing to do nothing in the face of state violence and ethnic cleansing." "To commit to political action, grassroots action, local action, and international action that will give us what justice requires, and that is a free Palestine from the river to the sea," Hill concluded, leading to applause. The phrase "free Palestine from the river to the sea" is often used by Palestinian nationalists and refers to eliminating Israel and placing the territory between the Jordan River and the Mediterranean Sea, where Israel currently exists, under Arab control. He also endorsed the Boycott, Divestment, and Sanctions (BDS) movement, which has been condemned by the Anti-Defamation League as one of the most insidious and deceitful efforts to delegitimize the Jewish state and promote anti-Semitism. The Gaza Strip, from which Israel unilaterally withdrew in 2005, is under the governance of Hamas, a terrorist organization that has fired thousands of rockets at Israeli civilians. The Palestinian Authority in the West Bank continues to pay bounties to terrorists who attack and kill Israelis and Americans. Part of the past Palestinian resistance includes the two violent "Intifadas," from 1987 to 1993 and 2000 to 2005, respectively, in which thousands of Israeli civilians were killed in terrorist attacks such as suicide bombings. Hill followed up his speech with a tweet making clear he was not interested in the "two-state solution." A frequent CNN guest, Hill last appeared on the network on Sept. 26 with Don Lemon, according to an IQ Media search. A CNN spokesman did not reply to a request for comment. Hill, responding to criticism of his comments online, defended his remarks and noted he has a "huge problem" with Hamas, which is, again, a terrorist group. He also said he never called for Israel's destruction. In my remarks, which also marked the 70th anniversary of the Universal Declaration of Human Rights, I addressed the various ways that Palestinians are actively being denied access to basic human rights. I also discussed how the Trump Administration’s policies are undermining peace and justice. At the same time, I pointed out the ways that American Middle East policy BEFORE TRUMP has also failed the project of peace and democracy. I have a huge problem with Hamas. I’ve been consistent on that. Responding specifically to backlash to his remarks about a free Palestine "from the river to the sea," he said it had a "variety of meanings" and wanted a redrawing of the borders before the 1967 Six-Day War.